I am putting together a few 2bbl Weber kits for use on 140 engines. 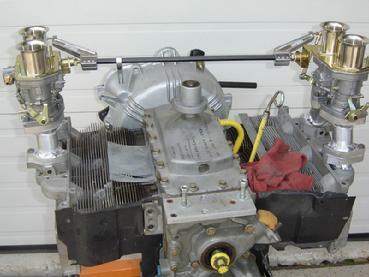 These will include a pair of 2bbl 40 IDF Weber carbs, custom manifolds, air filters, linkage and gaskets. I make a linkage adapter to connect the Weber linkage to the stock Corvair throttle rod. This is also supplied. They will be a bolt on kit. 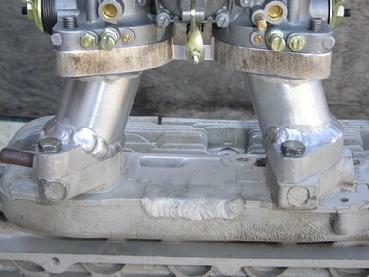 Jetting may be necessary for your engine set-up and local elevation. No specials on this Weber kit. The price is $1340.00 plus shipping. 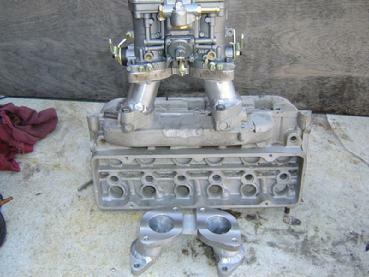 The manifolds alone sell for $395.00 plus shipping. For those of you that already have the Weber carbs. These manifolds can also be used to fit the Weber 2BBL series throttle bodies to the 140 engines. These tb's look like the carbs and fit the same. Bore is 45MM. An easy way to add EFI to your 140. Above left are the manifolds with a 2bbl 40 IDF Weber. 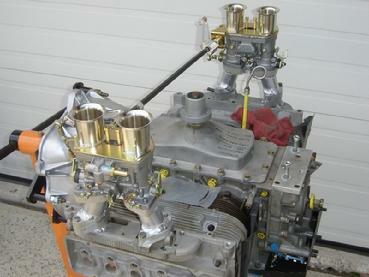 The Weber is shown with optional velocity stacks. I still need to finish machine and port match these manifolds. Here you go, a couple more pics with the set-up fit to the modified 95 heads. The linkage lines up very closely to the stock throttle rod coming into the engine compartment. My adapter attaches the two together perfectly. Here is a rear view of the 40 IDF Webers with the adapter manifolds. These are on the 95 heads I added the extra carb mounting pad onto. I have a couple more pictures on the Specials page. 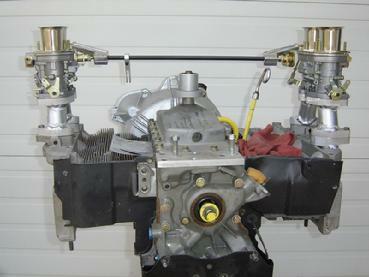 This is the engine I disassembled in order to balance the reciprocating assembly thinking I would use it on the Vert. What I found was a very poorly reworked engine. The case had been glass beaded - everywhere. The cam journals, main bearing saddles, lifter bores, etc. The case is junk. The lifters(new) were stuck in the bores and needed to be driven out with a brass drift. The crank had been turned .010" under sized and that very nicely. The rods were good and I installed ARP bolts. The P&C's are .040" OS with the cyl's being the 60 style with the full circle material around the stud holes but... the spigot that fits the head are early. The pistons are used. The cam is a new or reground Isky 280 but the cam gear is used and not fully seated against the thrust washer. Not good. I was going to install a billet fail safe gear and run this cam but I think I'll run the slightly used OTTO OT20 I have on the shelf. Might be a bit hotter than I originally planned. So I have some parts juggling to do to get this ready. Here are the photos I promised of the Weber manifolds. Manifold is a 3" tall unit with the 40 IDF Weber atop. This first manifold set are custom made to fit under the engine cover of a Devin C race car. 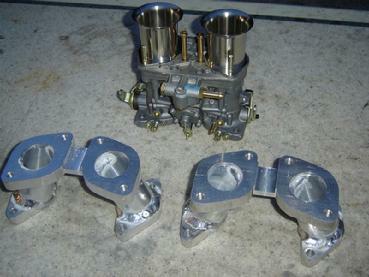 I will be building an engine for my 65 Vert to test these carbs and the manifolds. I'll put the car on the chassis dyno and see how this engine behaves. I can make manifolds for the 44 IDF and the 48 IDA Webers also. But... these larger carbs really should be used only on a high performance "built" engine. Not on a stock 140.